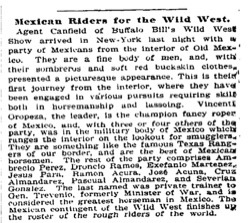 Mexican Riders for the Wild West. Agent Canfield of Buffalo Bill's Wild West Show arrived in New-York last night with a party of Mexicans from the interior of Old Mexico. They are a fine body of men, and, with their sombreros and soft red buckskin clothes, presented a picturesque appearance. This is their first journey from the interior, where they have been engaged in various pursuits requiring skill both in horsemanship and lassoing. Vincente Oropeza, the leader, is the champion fancy roper of Mexico, and, with three or four others of the party, was in the military body of Mexico which ranges the interior on the lookout for smugglers. They are something like the famous Texas Rangers of our border, and are the best of Mexican horsemen. The rest of the party comprises Ambrecio Perez, Droncio Ramos, Exefanio Martenez, Jesus Para, Ramon Acura, José Acuna, Cruz Almandarez, Pascual Almandarez, and Severian Gonzalez. The last named was private trainer to Gen. Trevenio, formerly Minister of War, and is considered the greatest horseman in Mexico. 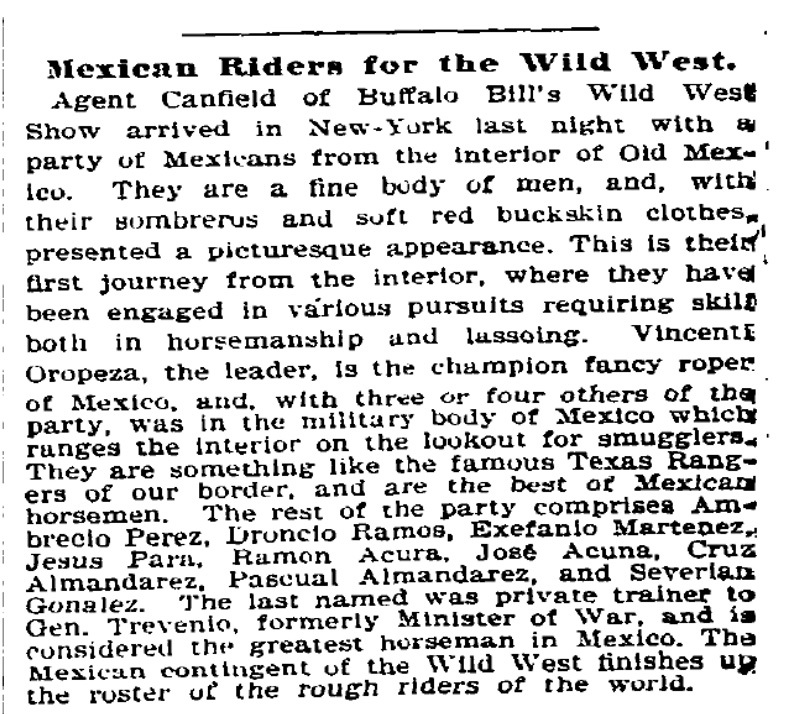 The Mexican contingent of the Wild West finishes up the roster of the rough riders of the world.